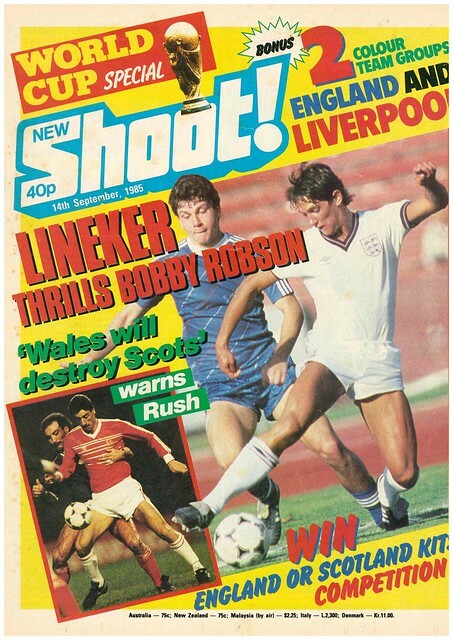 England’s new star striker Gary Lineker shares cover space with Ian Rush, ahead of a vital week of World Cup Qualifiers, with Rush stating that Wales will destroy Scotland. Rush gets a double page spread, saying that Wales will win and set up a Play-Off against a team from Oceania, due to Scotland missing the suspended Graeme Souness. Unsurprisingly, Scotland think they will get the win, according to Shoot columnist Willie Miller. The match ended in a 1-1 draw, a result which sent Scotland into a Play-Off against Australia, which they won 2-0 on aggregate to reach the World Cup in Mexico. The game will be remembered for the death of Scotland manager Jock Stein, who collapsed on the touchline moments before the final whistle. Sammy McIlroy gets interviewed about Northern Ireland’s game in Turkey, expecting Turkey to provide difficult opponents despite losing 8-0 to England earlier in the group. 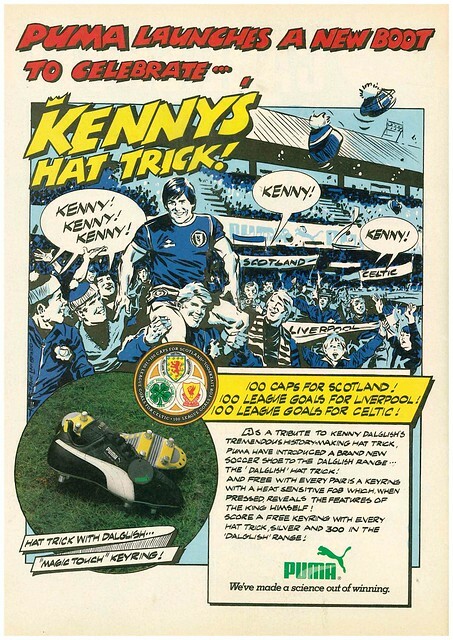 Kevin Sheedy gets interviewed about Republic Of Ireland’s chances of reaching the World Cup, stating that they can do it. 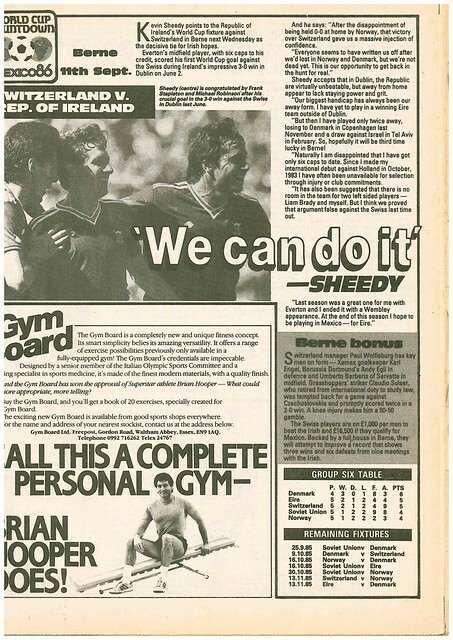 Sheedy had yet to win an away game in his international career, and would need to start doing so, with trips to Switzerland and Soviet Union coming up. 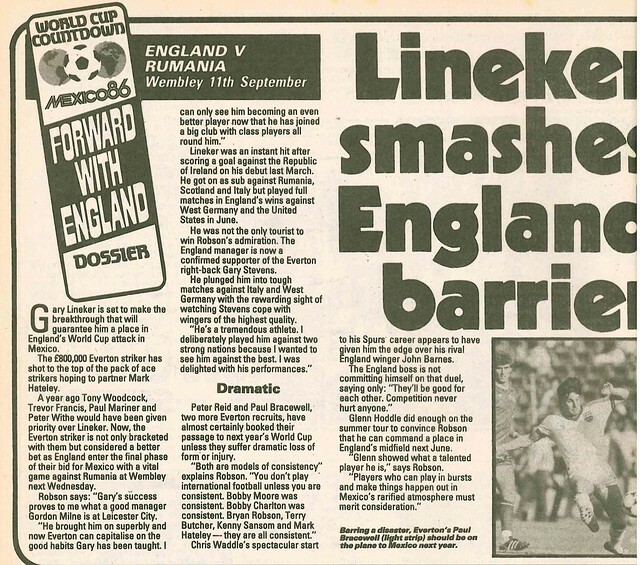 England’s game against Romania is previewed, with manager Bobby Robson singing the praises of Gary Lineker, who had only made his international debut earlier that year. 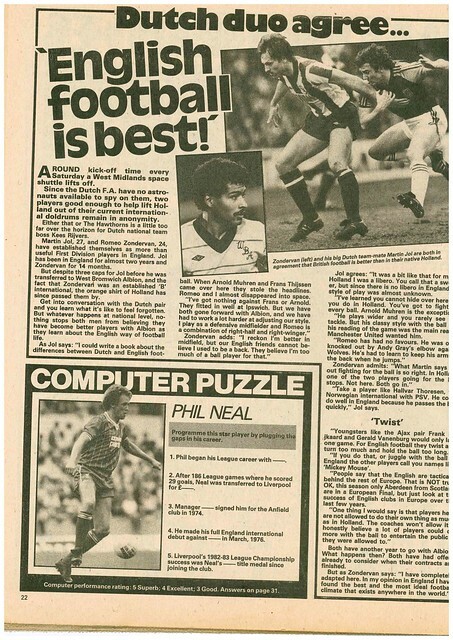 Bryan Robson uses his column to focus on players who are aiming to head to Mexico next summer, such as Adrian Heath, Paul Walsh, Peter Davenport, Steve Williams and Remi Moses. Celtic’s new star Alan McInally gets a double page spread, while Rangers also get a double page spread. Well, Queens Park Rangers. 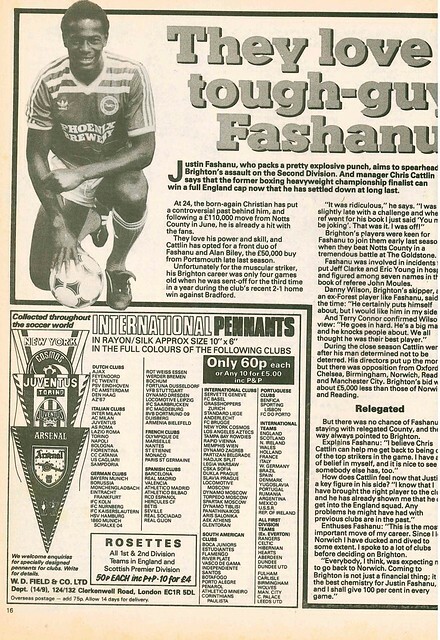 Justin Fashanu also gets a profile as he hopes to get Brighton promoted from the Second Division. 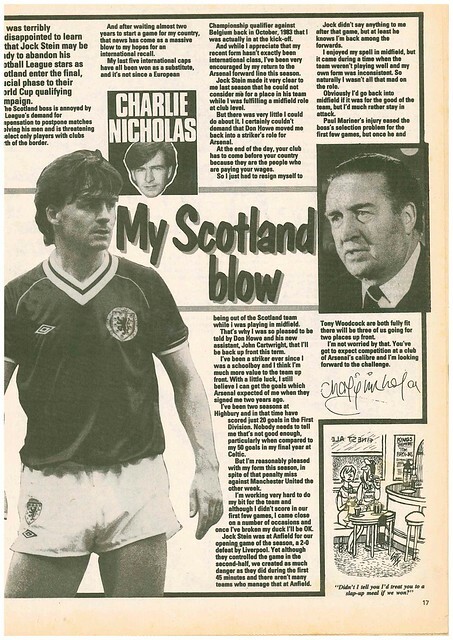 Charlie Nicholas uses his column to express his fears after Scotland manager Jock Stein considers picking only domestic based players after having problems getting access to English based players. 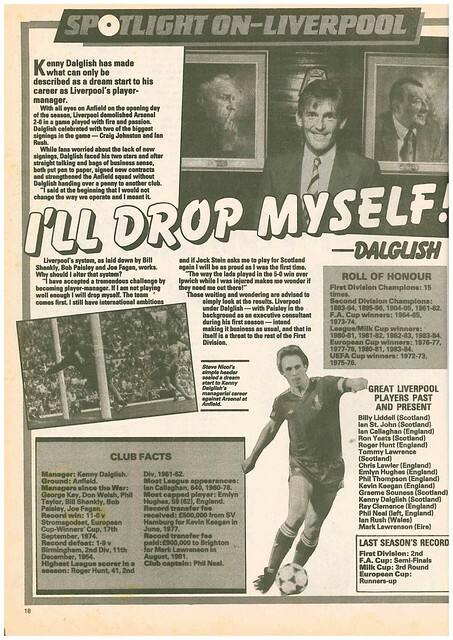 One Scottish striker not worried about not getting picked is Kenny Dalglish, also player-manager at Liverpool, telling Shoot he’ll have no hesitation in dropping himself. 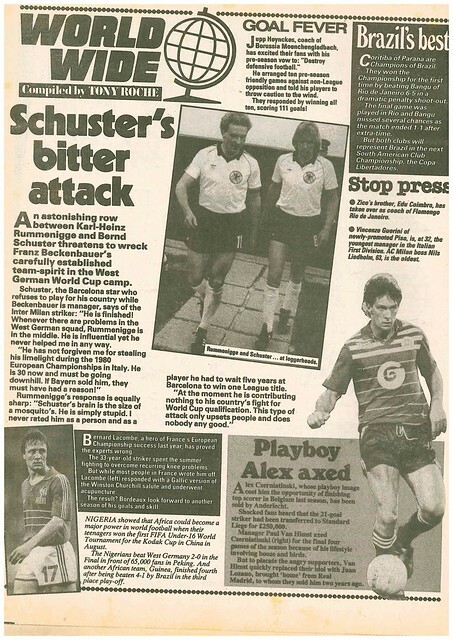 Meanwhile, there is disharmony with the West Germany squad, due to a row breaking out between Berndt Schuster and Karl-Heinz Rummenigge. Schuster was currently in international exile due to a disagreement with manager Franz Beckenbauer. 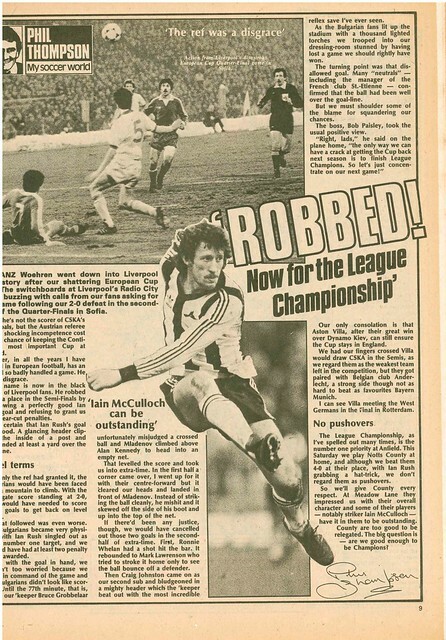 A dispute with broadcasters means that no club games in England are televised, so Shoot does double page photos of some of the best action. A week and a bit ago, I headed to London for a short break. It’s fair to say I enjoyed myself. Why London? Usually, in late January or early February, I like to go away somewhere for a weekend. I would have preferred to go to Mainland Europe, but there wasn’t a lot of value when I went to book it. September 2017 was a busy month for me so I didn’t get a chance to book anything until October. London was a lazy option, but still a good option. I’d been before previously and enjoyed myself. This was my first proper visit to London since 2014. I had been in London briefly in 2016, spending a day there as I was flying home from Gatwick after a stay in Paris. However, I would not be flying in and out of Gatwick. My previous visits to London had seen me use Gatwick, but this time, I would be flying in and out of Stansted. There would also be a change in my accommodation arrangements from my previous London visits as well. In my two previous stays in 2013 and 2014, I stayed in Paddington, but this time I would be staying at Easyhotel in Victoria. I would have to make do without a TV of Wifi in my room, but getting three nights in Central London for £87, I couldn’t really complain. Flying into Stansted meant I would be travelling through London, and I got to see cranes that were working on Northumberland Development Project, better known as Spurs New Ground, from the train window. Whenever I go away somewhere, there are two things I really want to see – Street Art and Football. With the train from Stansted terminating at Liverpool Street, it gave me a perfect opportunity to search for Street Art, as I would be near to Shoreditch, where I had visited on my previous visit in 2014. I walked around a bit and got lost, so I cheated by referring to the internet, London’s Tourism website has a feature on Street Art. After lunch, I headed back towards Liverpool Street, racking up the step count. Yep, I got an Activity Tracker for Christmas, so i’ve become one of those guys. In case you care, I had four successive days going over 30,000 steps. 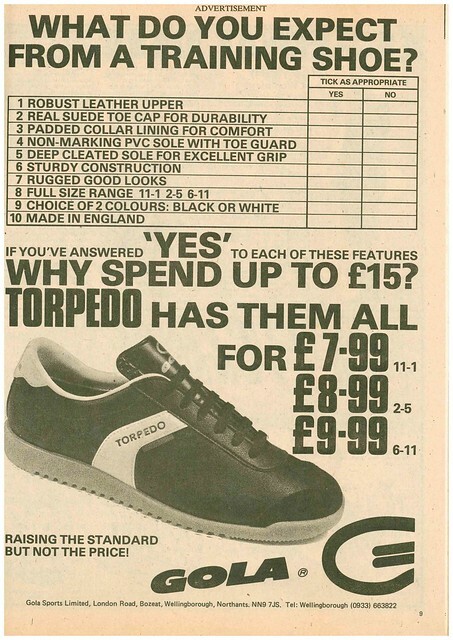 You’ve no idea how much my feet hurt. I stumbled into Spitalfields and specifically, Spitalfields Market. What a place. I’m annoyed at myself that I only discovered it on this visit. Having walked past a man in a Coleraine shirt at Liverpool Street Station, I got a reminder of Irish League when I visited a stall of Scrabble Art, motivational phrases spelt out with Scrabble letters, one of which said “Fortune Favours The Brave”. A more apt one for Linfield players would have been the one that said “Keep it simple”. £30 though, so I gave it a miss. Spitalfields Market had lots of fantastic independent and quirky stalls. I really am annoyed at myself for only discovering it on this visit. Having checked London’s Tourism Website, I was aware that there was a lot of Street Art in Spitalfields, so I went to check it out. I used my instinct and stumbled upon pieces. I kept saying to myself that i’ll just walk to the end of the street, then spot something on the next street, and I just kept walking and walking, snapping loads of Street Art, only stopping to pop into a Vintage Market I stumbled onto. If I ever visit London again, i’m going to make Spitalfields a place I visit. By Friday afternoon, it was time to check into my hotel. As stated earlier, it was Easyhotel in Victoria, a very convenient location for getting to and a very conveniently located hotel. I was in Room 13. Thankfully, i’m not supersticious about that number. It might have been a different matter if it was Room 9 after seeing the Hotel Zanzibar episode of inside Number 9. Just thought i’d sneak it in about how Inside Number 9 is the best thing on TV at the moment. My original plan was to visit Camden as soon as I checked in, but having spent so much time walking around Spitalfields, I was a bit behind schedule. I wanted to get Street Art photos in Camden, but with the sky getting darker, I decided I would leave that until Saturday morning. I had a teatime appointment in Covent Garden. I was aware that Turin Brakes were doing an instore gig at Fopp in Covent Garden, so I decided to head over. I loved them back in 2001, and I was getting a free concert, so it would have been rude not to. I headed to Covent Garden Underground Station to the venue. Did you know that Covent Garden Underground Station has 193 steps from the Platform to the Exit? I do. I found that out the hard way. The funny thing is, I saw a massive queue of people wanting to use the list. I thought they were being lazy. Turns out they were smart. I won’t be making that mistake again if I visit Covent Garden. After the instore gig, I went for a gentle stroll around Covent Garden, before getting a bite to eat before finding a bar to watch the United match, before heading to bed or a (relatively) early night. When you are in London, you can take advantage of free publications such as Time Out or Metro to see what is on, which is what I did. On Saturday morning, I headed to Brixton. I wanted to see the David Bowie mural in it’s current form. I had previously seen the mural in 2014. When he died in 2016, it became a shrine to him and a meeting point for fans to share their grief. There’ll be a write-up on the Bowie mural on the Street Art blog which will follow this. During my time in Brixton, I spotted and snapped Street Art, checking out Brixton Market, and taking a stroll along Electric Avenue, immortalised in song by Eddy Grant. After Brixton, it was Camden next for me, for pretty much the same thing, snapping Street Art and checking out the market. Every time I go to London, I make a point to visit Camden. The only downside is that it is infested with smelly tramps puffing on fags and vapes. Not cool. It really drags down the standard of the place. Camden Underground Station is exit only, so to leave Camden, I had to get The Tube at Mornington Crescent. I took advantage of this detour by stumbling onto some more Street Art. Saturday afternoon was spent watching Millwall v Rochdale in the FA Cup. I checked the listings guides and there were some comedy gigs on, but I decided to go for a bite to eat, and then relax. Up early, Sunday morning was spent being all touristy, having a walk around the main City Centre shopping areas such as Leicester Square, Carnaby Street, Soho, Covent Garden and Trafalgar Square. Another day, another market, having a stroll though Covent Garden Market, and catching part of an entertainment show by Covent Nick. I then headed back to Brixton to purchase stuff that I had my eye on the previous day (I didn’t want to take loads of shopping bags to a football match) before heading to The London Studios for the recording of Unspun for Dave. Unfortunately, I got lost, and found myself at the back of the queue, meaning that I missed out on getting a seat. There is compensation that I can get priority tickets for future TV recordings, so at least I can bank that for use at some point in the future. I took the opportunity with my unexpected free time to walk along Southbank and check out Southbank Book Market, and taking in some of the views on offer at Southbank, before putting my feet up for the night. Monday was a more relaxed day. Not going to lie, I was very tempted by a day trip to Brighton, especially as I was staying near to the train station that serves Brighton from London. If I was flying out from Gatwick, I would definitely done so, as there is a train direct from Brighton to Gatwick which is just over half and hour. If I go to London again, I might book an extra day and set it aside to go to Brighton. I took the opportunity to head back to Southbank and walk along Jubliee Greenway. I was even able to see the Houses of Parliament, but as I have minimal interest in politics, I found it a bit meh to be honest. I was more excited at seeing the roof of Spurs new ground. There was one last piece of Street Art for me to spot, calling in to see Leake Street Tunnel on my way back to Waterloo Station as I headed back to Spitalfields Market for a bit of lunch and relaxation before heading to Stansted to fly home. As previously stated, I stayed in Paddington on my previous visits to London, changing to Victoria for this one. I like Paddington, and I enjoyed my stays there, but if I go back to London, I would try to use Victoria again, especially as you can have the option of a day trip to Brighton on your last day if I was flying back from Gatwick. At the end of it, I had very sore feet and a lot of photos to sort through. I guess that was the sign of a good trip. 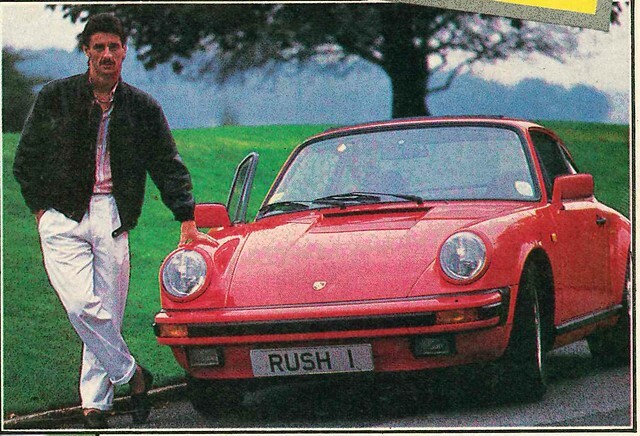 With a new national team manager appointed and the league season due to Start, the cover of this edition of Shoot doesn’t just focus on Scotland, but a Welshman bound for Italy – Ian Rush, who has just signed for Juventus. As you open the magazine, there is a double page feature from Shoot columnist Bryan Robson, with his hopes for Manchester United in 1986-1987, with him expecting Gordon Strachan, one of Scotland’s stars at the World Cup, to continue his return to form. 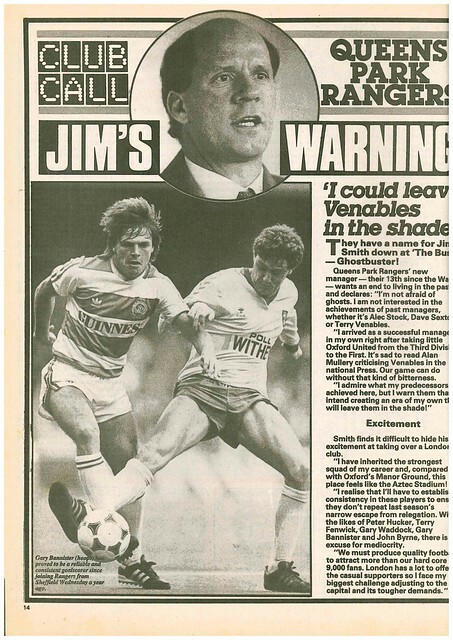 Shoot’s editorial focuses on Billy Bingham preparing to agree to become manager of Saudi Arabian club Al Nasser while managing Northern Ireland as well, and that he could struggle taking on the two roles at the same time. 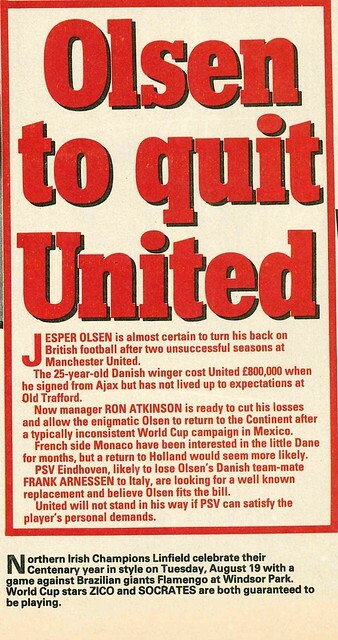 In news, Jesper Olsen is set to leave Manchester United, with PSV Eidnhoven his most likely destination, while across Manchester, City manager Billy McNeill wasn’t too unhappy at missing out on the Scotland job, as he and his family were settled in the North-West of England. Northern Ireland’s champions Linfield are celebrating their centenary with a friendly against Brazilian side Flamengo, with Zico and Socrates both guaranteed to be playing. It’s a new era in Scotland with the top flight now comprising of 12 clubs, and Rangers have a new manager in Graeme Souness, beginning the season away to Hibs. 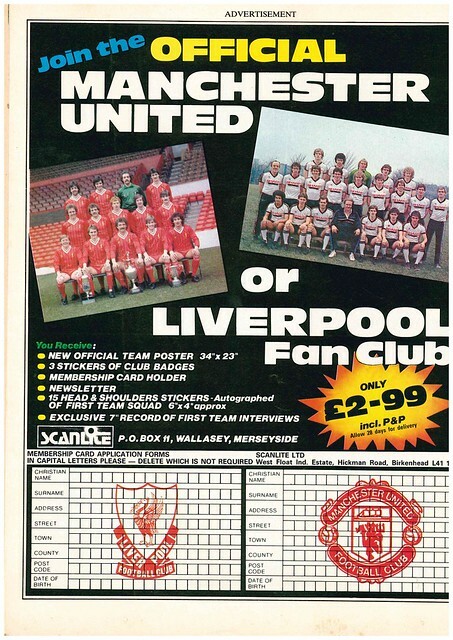 There was a double page spread with the fixture lists for England’s top four divisions. 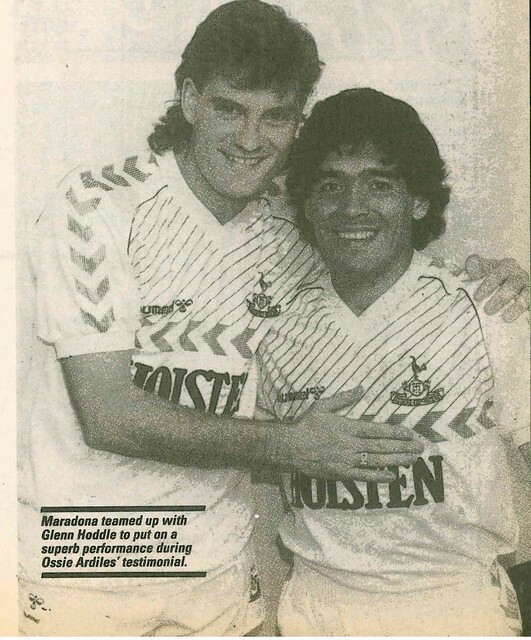 One player determined for make a good start in that new season was Graham Roberts, who wasn’t selected for the World Cup, blaming himself for that, but he did get to face England’s nemesis Diego Maradona, as he had played in Ossie Ardiles Testimonial in May. With players such as Warren Aspinall and Mike Newell joining top flight clubs, Wigan Athletic get a feature, looking at their reputation as a breeding ground for tomorrow’s stars. 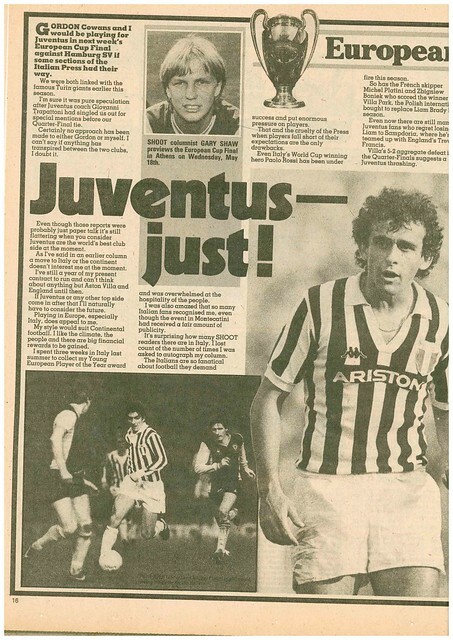 A current star is Ian Rush, who has signed for Juventus, but will play for Liverpool for a season before heading to Turin in 1987. In the feature, Shoot looks at the fortunes of players who have previously moved between British clubs and Italian clubs. 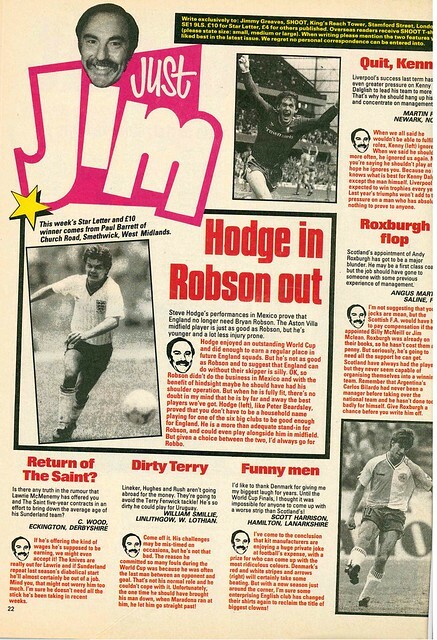 In letters, one person wants Bryan Robson replaced in the England team by Steve Hodge, one person hates Denmark’s kit and a Scottish reader is unsure that Andy Roxburgh should have got the job as national team manager. 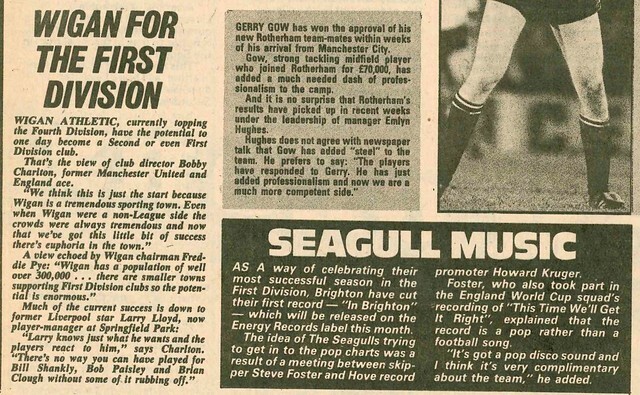 With Wimbledon about to begin their first season in top flight football 9 years after being elected to the Football League, with Shoot looking at what challenges face clubs looking to enter the Football League, as 1986-1987 was the first season to have promotion and relegation to and from the 4th Division. Beside it, Shoot has a feature on World Cup stars moving outside their native countries to head to Mainland Europe on their back of their World Cup performances. Also on the move was Alan Mullery, who had returned to Brighton for a second spell as manager, and gets a full page feature. Someone who was on the move for the first time was Paul Power, who signed for Everton after 11 years at Manchester City. The PFA have set up a working group amongst clubs in the North-West of England to try and make football more family friendly. 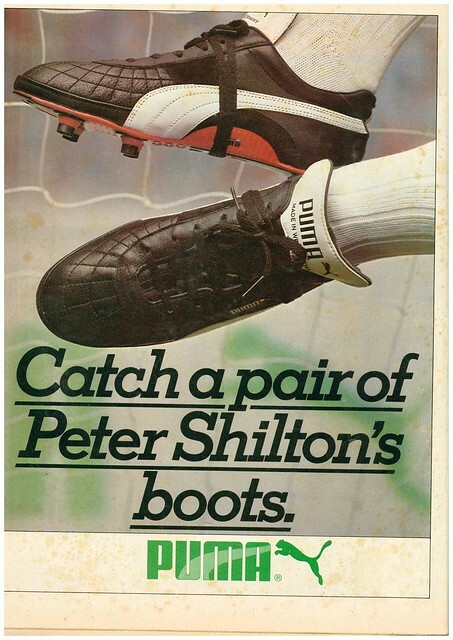 In adverts, Puma have brought out a new Kenny Dalglish branded boot. It’s the FA Cup Semi-Finals, and this is reflected on the cover with a player from each competing club – Leicester City, Queens Park Rangers, Tottenham Hotspur and West Bromwich Albion – are featured. As you open the magazine, there is a double page spread on the two games, with a player from each club giving their thoughts ahead of their game. In news, Bobby Charlton was complimentary about Wigan Athletic, stating they had the potential to become a top flight club. They eventually would be, 23 years later. 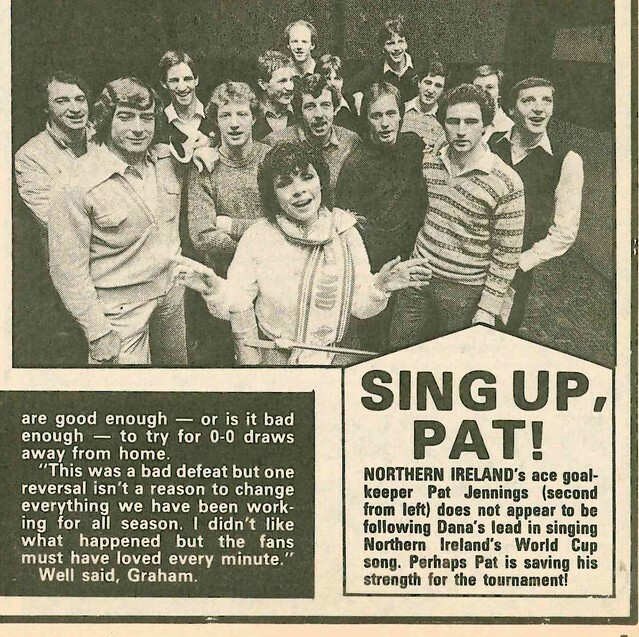 Talking of pop records, Northern Ireland have done one as well for the World Cup with former Eurovision winner Dana. It got better for the squad. As well as getting to do a record with Dana, they got a £77,000 bonus between them. It’s all change at Everton with manager Howard Kendall placing his emphasis on young players, including goalkeeper Neville Southall, who he compared to Peter Shilton. In competitions, you can win a trip to the World Cup Final in Madrid. 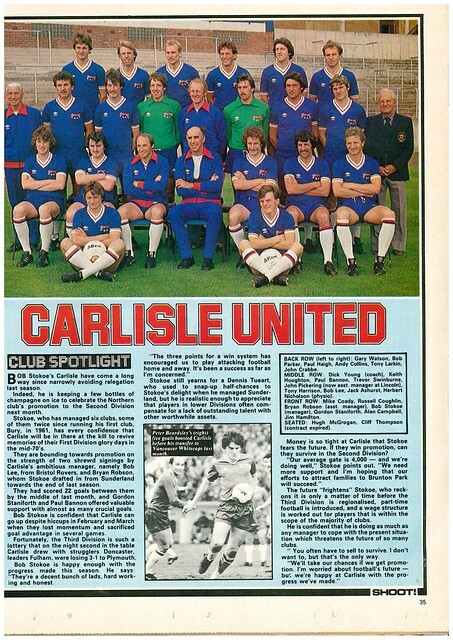 There is a full page feature on club football in the USA. There is a poster of Pat Jennings for a series called “World Cup Stars To Watch”. Jennings was rumoured to be attracting attention from clubs in North America. 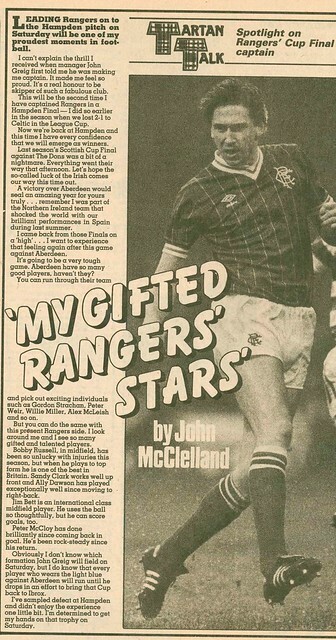 Not content with heading to Spain that summer, Jennings was also looking at trying to play in the 1986 World Cup. In Scotland, the Scottish Cup is also at the Semi-Final stage, with both games being previewed. Danny McGrain’s column discusses a recent 5-0 win for Celtic against Rangers, but it wasn’t their Ibrox rivals they faced, it was a Hong Kong team with the same name, during a mid season break for Celtic. 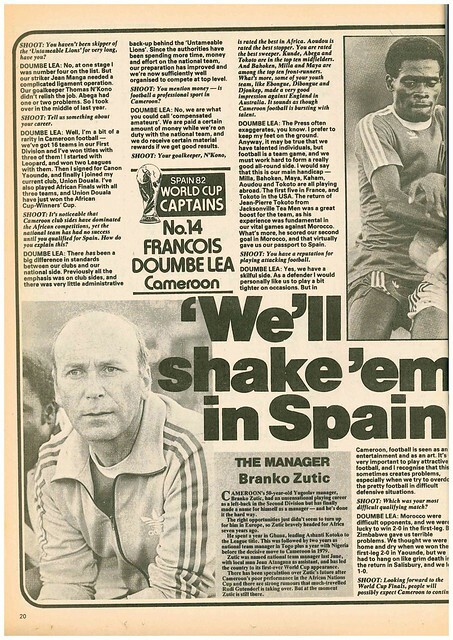 With the World Cup approaching, Cameroon get a double page feature, with an interview with Francois Doumbe Lea and a profile of their manager, Branko Zutic. 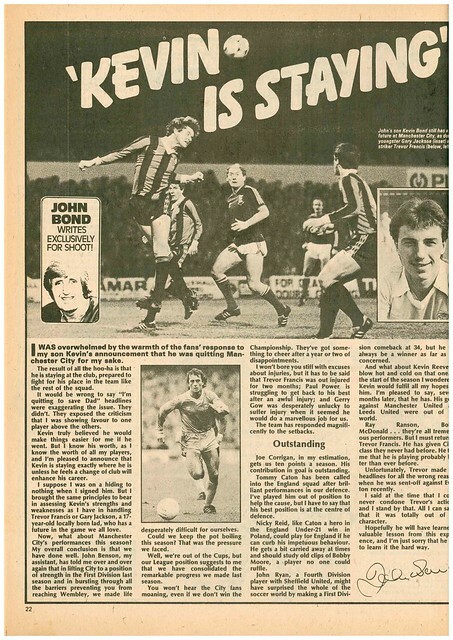 Manchester City manager John Bond uses his column to clarify rumours about his son Kevin’s future, stating that he was staying at Maine Road. 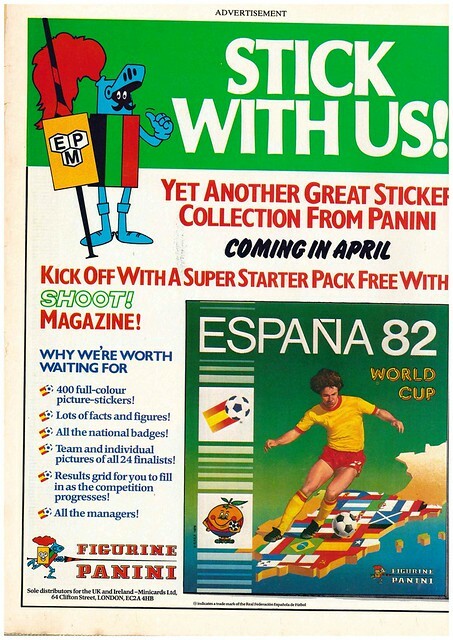 In adverts, there is an advert for Panini’s World Cup sticker book, which is going to be free in Shoot in the coming weeks. Going to the World Cup is Jim McLean, as part of Scotland’s backroom team. He combine that with his role as Dundee United manager, and Director at Tannadice, a role he has recently accepted. 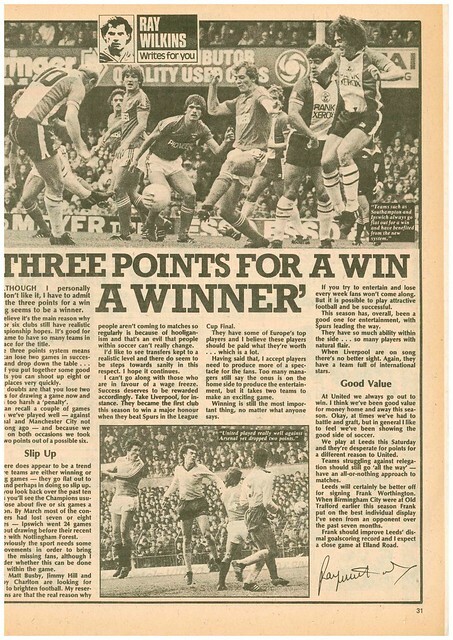 1981-1982 was the first season of 3 points for a win in England, and Ray Wilkins uses his column to declare it a success, though admitting he’s not a fan of it. In international news, El Salvador will only be taking 18 players to the World Cup due to costs, while Felix Magath faces a race against time to be fit for the World Cup due to injury, with the story accompanied by a picture of him being visited in hospital by Horst Hrubesch, Ernst Happel and Gunter Netzer. 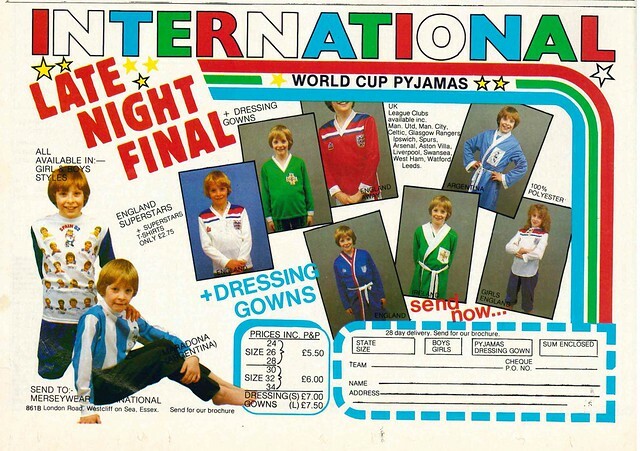 In adverts, you could buy pyjamas in the colours of your favourite team’s kit – as long as you supported England, Northern Ireland or Argentina. There were also various club team options not pictured. Shaw also comments on team-mate Allan Evans getting a Scotland recall, stating that playing against Dynamo Kiev in the previous round could be helpful for Scotland’s group game against the Soviet Union, as most of their squad is made up of Dynamo players. He signs off by wishing Tottenham Hotspur good luck in their European Cup Winners Cup Semi-Final against Barcelona. 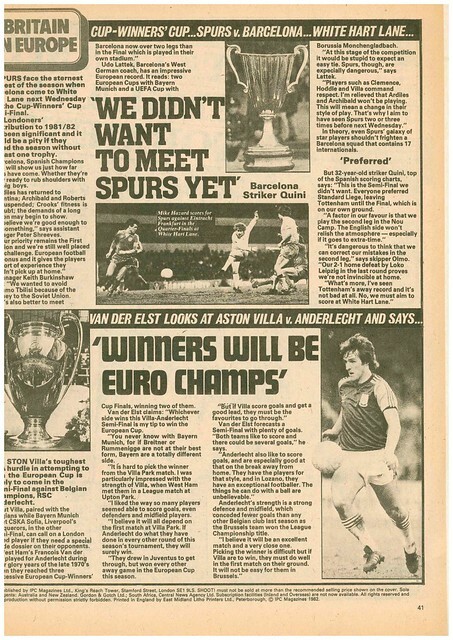 Villa and Spurs ties are previewed from the Spanish and Belgian viewpoints, with West Ham’s Francois Van Der Elst stating that the winners of Aston Villa v Anderlecht will go on to win the trophy. 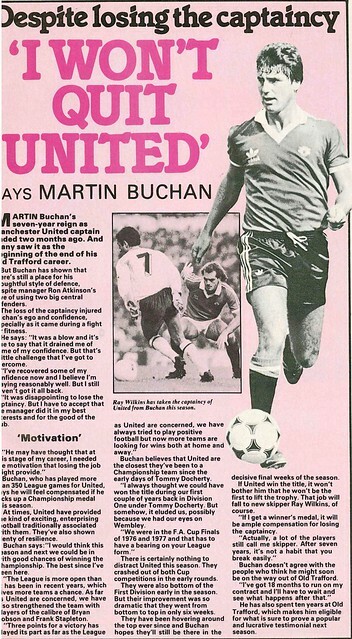 The magazine ends with an interview with Martin Buchan, who states he is not planning to leave Manchester United, despite losing the captaincy. 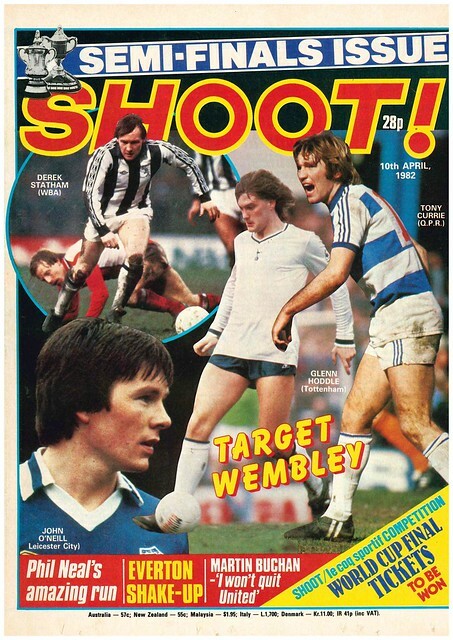 It’s Cup Final Day in England and Scotland, but it’s the English game that is on the cover of this week’s edition of Shoot, as Brighton take on Manchester United at Wembley. 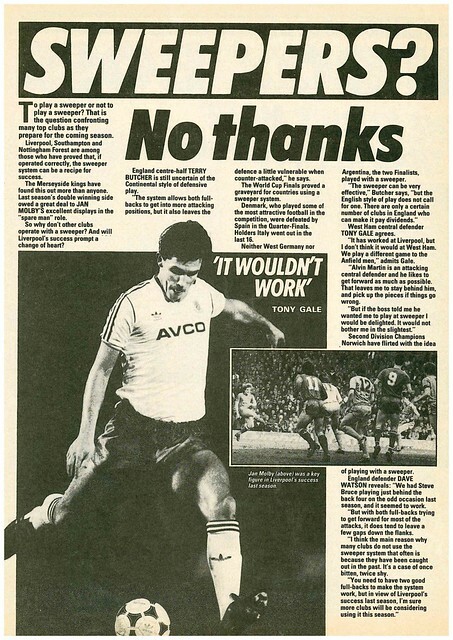 As you open the magazine, there is a double page spread with Bryan Robson, Jimmy Case and Michael Robinson giving their thoughts on the game, with Robson wanting to win the cup for Remi Moses, who was suspended for he game, alongside Steve Foster of Brighton. 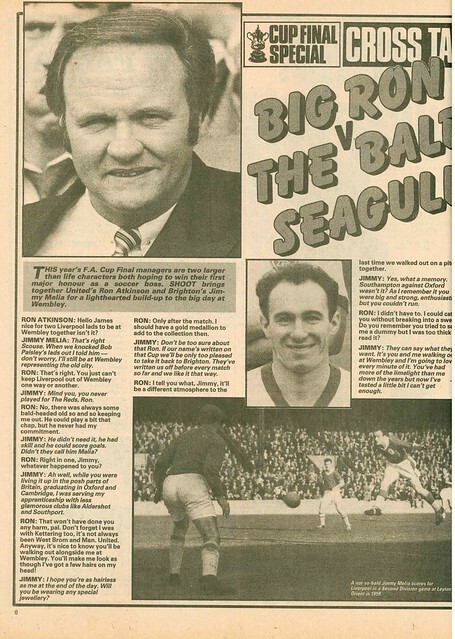 There is also a double page interview with the two managers, Ron Atkinson and Jimmy Melia, both Scousers. There is a feature on the two referees in London and Glasgow, with David Syme achieving a rare double, referee the Scottish Cup Final 16 years after his dad did. 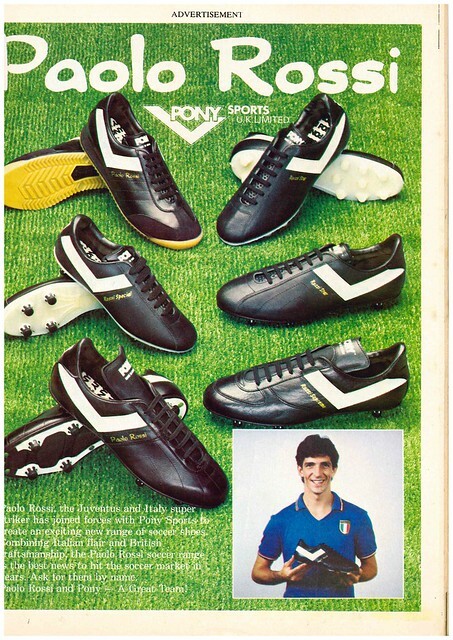 In ads, you could buy a Paolo Rossi branded boot, made by Pony. In posters, the centre page spread is a poster collage of Manchester United and Brighton players. 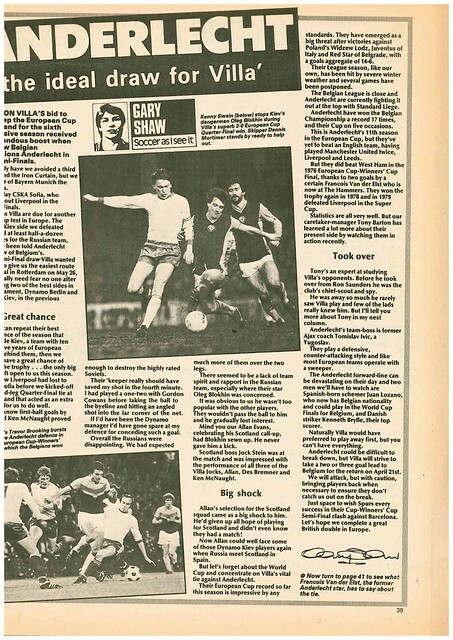 Gary Shaw previews the European Cup Final between Juventus (who eliminated holders Aston Villa) and Hamburg, with Shaw predicting a win for Juventus, and addressing rumours of a move for him and Gordon Cowans to Italy, stating he is well suited to continental football. Shaw also previews the FA Cup Final, stating he wants United to win, only because it would secure a UEFA Cup place for Aston Villa. 1983 was the year Everton won the league …….. for Liverpool, with a 2-0 win over Manchester United at Goodison Park which ended United’s title challenge, with Everton defender Mark Higgins believing the club are on the verge of making a serious challenge in future years to send the title to the blue half, rather than the red half of Merseyside. Another Blue (of the Manchester variety) hoping for a big future was Alex Williams, who had a breakthrough season at Manchester City, and was setting his sights on being England’s goalkeeper. 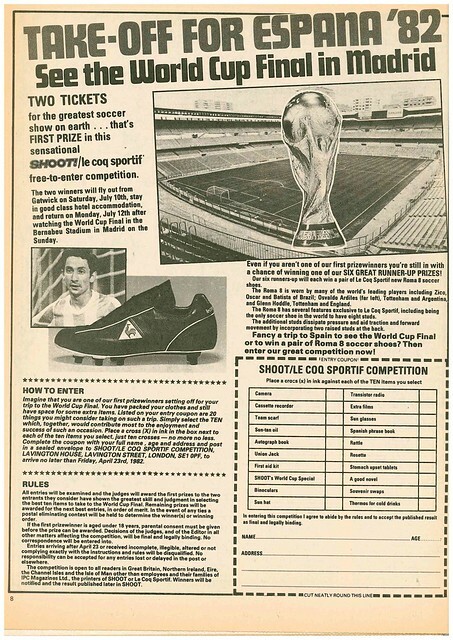 It wasn’t a World Cup year, but there was news about the competition this week, with the official film of the 1982 tournament being broadcast on TV after cinemas in the country deemed it too expensive to show., while Toluca was rejected as a host city for Mexico 86 sue to security fears. From the World Cup to the British Championship, Northern Ireland head to Hampden Park looking to get their first win in 7 visits. A more prouder record, is Sammy McIlroy, who has played in Northern Ireland’s last 22 games and is looking to continue that run. 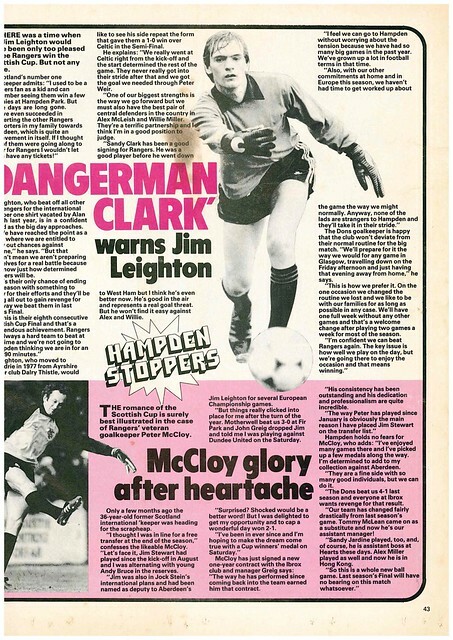 There was also coverage of the Scottish Cup Final, with a poster of Aberdeen and Rangers, and interviews with John McClelland, Peter McCloy and Jim Leighton. There’s a Welsh theme to this week’s cover of Shoot, as Gary Speed and Dean Saunders, battling for possession are the cover stars. The editorial for this edition looks at recent postponements, and dismisses the idea that English football should have a Winter break. Seems some debates never die. Posters included in this week’s edition are a random bunch : Don Hutchinson, Lawrie Sanchez, Dundee United team, Martin Keown and Jorginho. It’s the weekend of the FA Cup 4th Round, and Manchester United take on Brighton at Old Trafford, in a repeat of the 1983 Final. 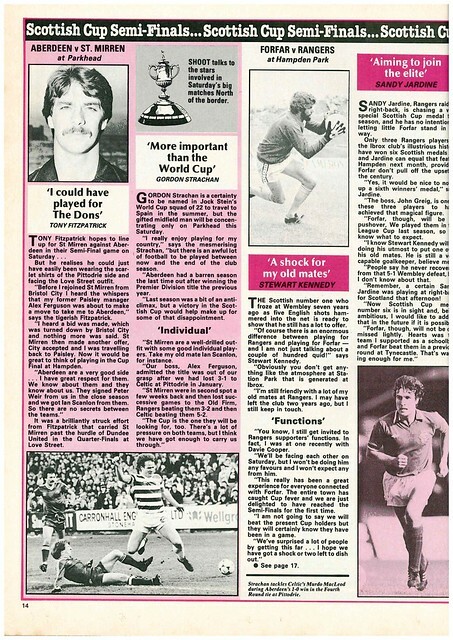 Steve Foster, in a second spell at Brighton, played in the replay (He was banned from the final) and was interviewed about the game, and his memories of 1983. In Jimmy Greaves Letters Page, a reader from Corby writes in to question QPR’s 5 million pound valuation of Les Ferdinand. In 1995, Les Ferdinand left QPR for Newcastle for a fee of 6 million pounds. Shoot dedicates a double page spread to reviewing the standard of punditry on BBC, ITV and Sky Sports. Gary Lineker is described as “His attempts at humour are like Ian Botham on A Question Of Sport (ie – not funnny at all)” – I could not possibly comment. Meanwhile, Kevin Keegan is given a platform to showcase his four point plan for the future of English football, which includes reducing the Premier League to 18 teams (It was reduced to 20 teams in 1995), Professional referees, five subs (This was introduced to the Premier League in 1996) and games being split into four periods of 25 minutes. Oh well, three good ideas out of four aren’t bad. 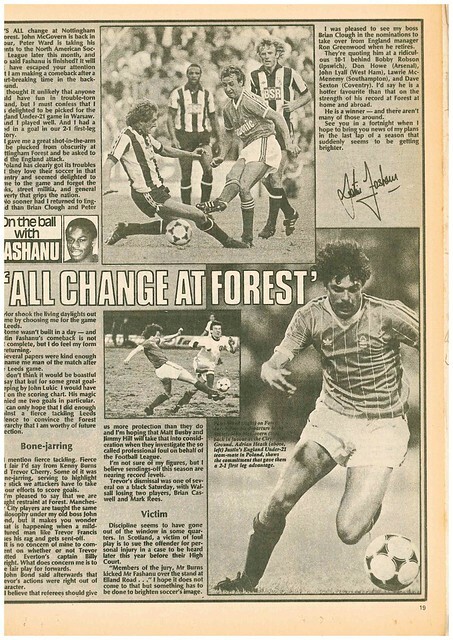 Neil Webb, having rejoined Nottingham Forest from Manchester United gets a double page profile about the move. Shoot did a series during this season where they visited clubs to see who could win a 100m Sprint, Hardest Shot, Long throw. There was a shock at Dundee as goalkeeper Paul Mathers had the hardest shot. Unfortunately, his score for Longest Throw and Hardest Shot weren’t enough to get him in the overall Top Three, taken from all the clubs who had participated so far. Maybe it was that article which convinced David Jeffrey to sign him for Linfield in 1999? Harvey Lim of Gillingham (Longest Throw) and Neil Masters of Bournemouth (Hardest Shot) were the leaders, since you ask. The season finally started in August and it was a wet Mourneview Park for me on the opening day to see Linfield take on Glenavon. The following week, I was on a week long break in Edinburgh, so I took the opportunity to see a local game, Hearts v Aberdeen. As luck would have it, Hearts were also at home in the following midweek, against Tottenham Hotspur in the UEFA Cup, and I managed to blag a ticket for this. The following weekend, I was in Brighton for a short break. I was unable to get a ticket for the match at The Amex, but I did get some shots of the exterior of the stadium. Seeing as it’s the end of the year, almost, I thought I’d keep you all up to date with my STLFTEM for 2011. For those who don’t know, STLFTEM is basically Something To Look Forward To Every Month. I started it in 2009, and it basically is to have something to go, see or do every month, and look forward to it. The only rules are that it has to be something seen in person. Therefore, watching Euro 2012 on TV won’t count for June next year. Also, I can have more than one STLFTEM each month. In fact, I can have as many as I wish. January was a bit of a cheat, as I went to the Linfield v Glentoran match postponed from 26th December 2010. But, my lifestyle ethos, my rules. February was a bumper month as I went to Barcelona for a weekend, and then the following Wednesday, I went to see Northern Ireland take on Scotland. March was also a Northern Ireland match. A 0-0 draw v Slovenia. Yep, that was well worth the wait. April was a bumper month with a title showdown for Linfield against Crusaders and three matches against Glentoran, one of which was an Irish Cup Semi-Final. Not only that, but there was also the matter of Beady Eye’s first concert in Belfast. Four wins, and an excellent concert made it a worthwhile month. May was all about travelling as I went to the UEFA Cup Final, and Manchester United’s last match of the season, against Blackpool. July was also quiet, but Linfield playing in Europe and a pre-season friendly against Derriaghy were enjoyable. As I stated earlier, some months are a struggle. August was busy with the start of the new Irish League season and trips to Edinburgh and Brighton. October was another concert at Ulster Hall, Noah and the Whale. There were fantastic. I’d hoped that November would be going to the MTV EMAs. Unfortunately, I wasn’t able to get a ticket, so I had to make do with a trip to Old Trafford to see United take on Sunderland. Well, that is how i’ve managed to have STLFTEM throughout the year, but I’ve already got some lined up for 2012. In January, I’m going to see Roy “Catchphrase” Walker as part of the Out To Lunch Festival. February will be a busy month as I’ll be taking a break to Amsterdam from 3rd-6th, then going to see Noel Gallagher at The Odyssey on 16th, before flying to Manchester on 23rd. I’m hoping to see United v Ajax. I’ve no ticket sorted as yet, but I’m confident I’ll get one. Pretty tempted to go and see The Beat at The Limelight in March. Undecided as yet. August of course, will see me head to Edinburgh for the Festival. If I could afford to, I’d spend the whole month there. So that, is how I’ve managed to enjoy myself at least once a month this year and how I plan to do so next year. If you have any suggestions for any of the months, feel free to get in touch and suggest. A busy month full of travel began in the most glamourous of settings of a rainstorm in Lurgan, as Linfield travelled to Glenavon on the opening day of the 2011-2012 Irish League season. It literally rained throughout the whole match, and I wasn’t in a brave enough mood to move from my seat to get photos. I did get a nice portrait shot of Mourneview Park at the end of the game though. The following Saturday, I was in Edinburgh. The weather wasn’t much better though. I was over for the festival, but with Edinburgh having two SPL teams, I decided to take in a match as well. That day, Hearts were playing Aberdeen, and I managed to get into a good shooting position. The following Thursday, as a bonus, Hearts played Tottenham Hotspur in a UEFA Cup tie, and I managed to blag a ticket, and get some good shots. I also managed to get a lovely shot of Princes Street Gardens on the Sunday teatime between the two games. Managed to stumble across some excellent graffiti in the University area of the city. From Edinburgh, I headed to Brighton for the weekend, and loved it, a fantastic city. Managed to get some fantastic sunset shots and some street art pictures as well. I’d hoped to get to a match at The Amex but couldn’t get a ticket unfortunately, but I did manage to get some nice shots of the exterior of the ground. Whilst in Brighton I headed to The Amex. Unfortunately, I was unable to get a ticket for the match against Blackpool. Looks like a fantastic stadium. Did manage to get some portrait exterior shots. For the background of Brighton’s move to The Amex, see here.